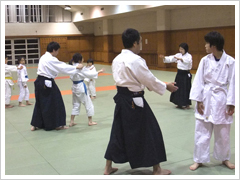 If you would like to watch our class, you are welcome at any time to visit our dojo during our class hour. 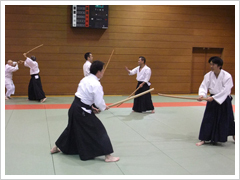 For details on Tobu dojo, please call 080-3487-6622 (Mr. Wada). Tobu Isezaki line, Kasukabe sta. From the west exit of Kasukabe sta., take a bus bound for 'Kasukabe Onsen, Wing Hat Kasukabe'. Get off at 'Onuma Koen'. Tobu Noda line, Iwatsuki sta. From Iwatsuki sta., take a bus bound for 'Koshigaya sta.'. 10 min. walk from 'Fujimi-cyo' bus stop. Copyright © 2018 Aikido Kobayashi Dojo. All rights reserved.